When I’m making multiple cards, I tend to turn to kits or packs of decoupage with matching papers, it’s like a dating app for papercraft. Some combinations are a definite ‘no’, others are an instant match and some are more of a slow burn. For Christmas I was given the Docrafts Forever Friends Classic Decadence paper and decoupage set. 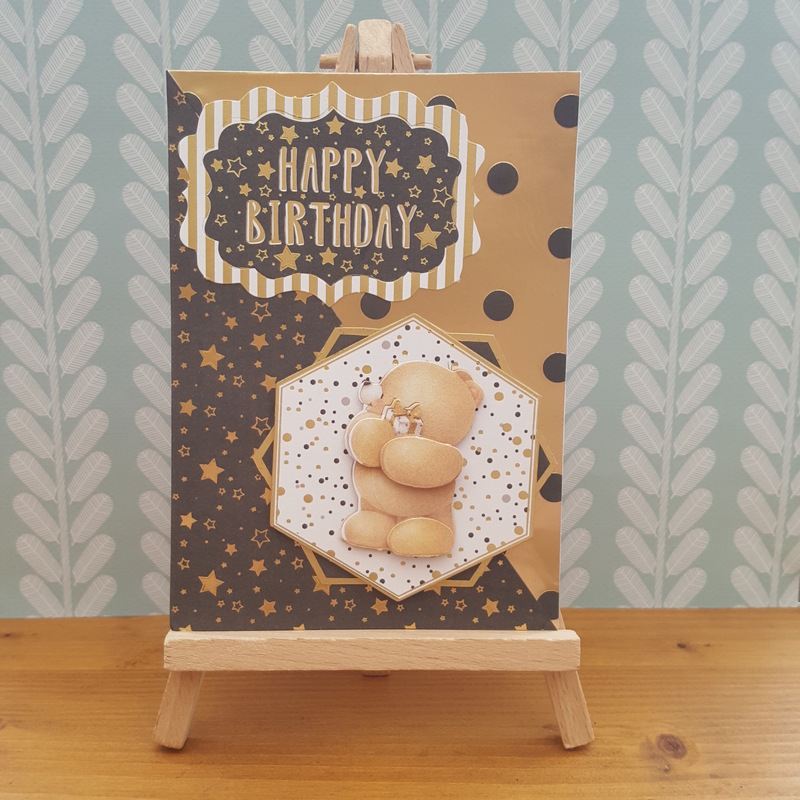 It’s a great set as it’s really versatile, with options to make both masculine and feminine cards for all occasions and enough materials to make a lot of cards. I had a card to make for one of my closest friends for her birthday, and since it was being hand delivered I went to town on the decoupage and used all the layers. (I normally skip one or two to make sure it’s within postage limits for a regular letter!) 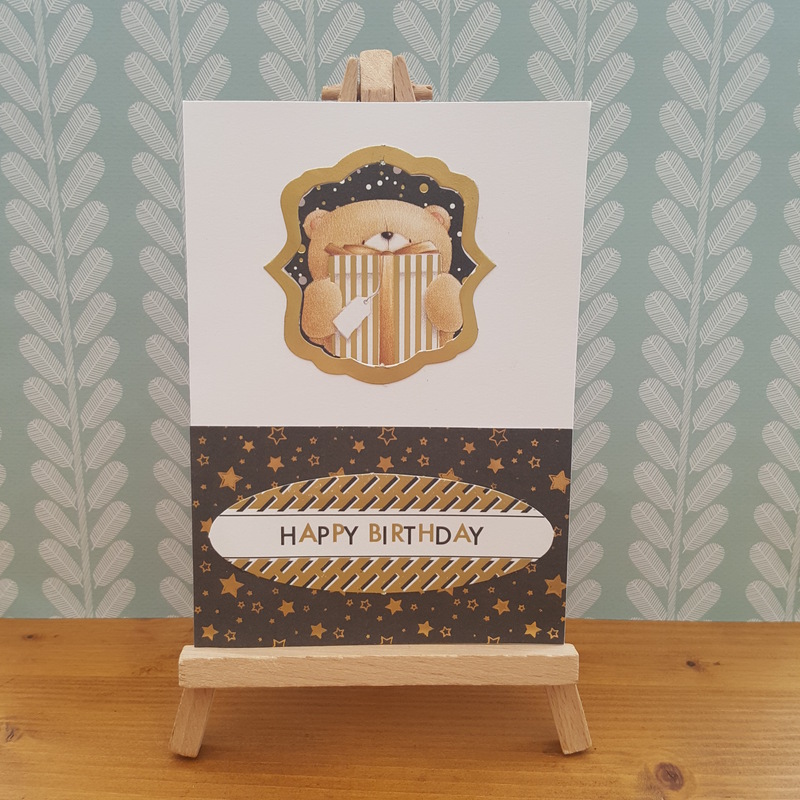 I used contrasting papers cut on a diagonal for a change and the chose one of the die cut greetings. Really simple to make, but I think it looks luxurious with the black and gold together. 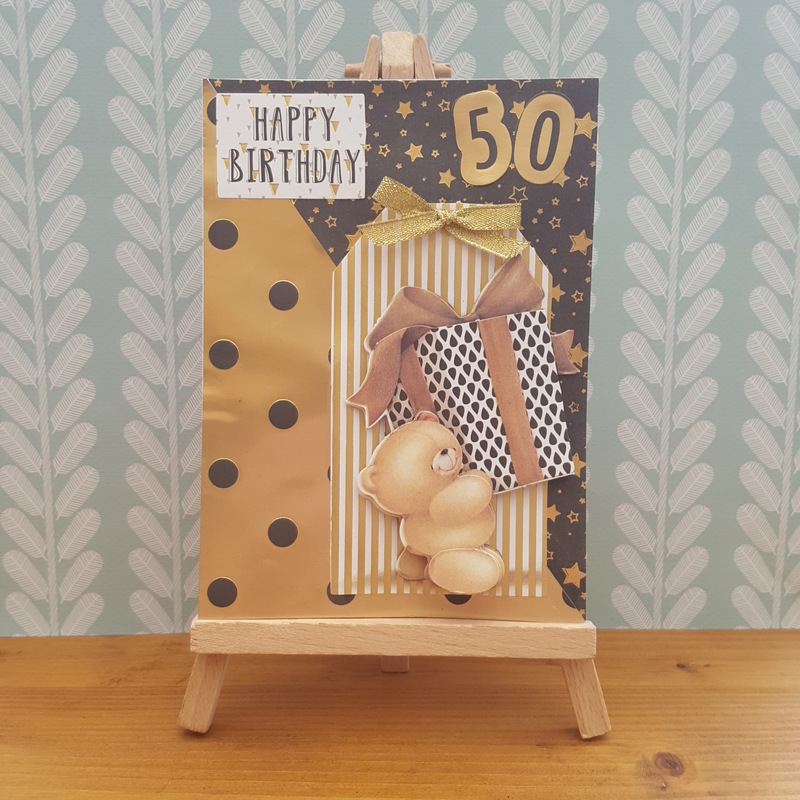 The next card is a 50th birthday card for my step mum. I wanted to make another posh one, and again it was being hand delivered so the decoupage was out in force. The kit comes with alphabet and number stickers so I was able to add them as a nice reminder of her age! I finished this one off with a gold glittery bow, just because. It was a handy way to use the other halves of the diagonal cut pieces from the first card too. There we have it, three birthday cards made in bulk in an hour and a half, and not a cheap loo roll in sight! As this is a cardmaking post, I thought I’d also share that my blog got included in a list of top 100 cardmaking blogs which was a huge surprise, and of course very exciting. It also meant I could add a badge (which took some figuring out!) but it worked in the end. You can check out the full post here. More beautiful cards! I can see why you got nominated 😊 Congratulations! Congratulations! Well deserved…..your cards are always wonderful! Those are lovely! Congratulations on making that top 100 list! Thank you, it was a real surprise. Those are gorgeous. I’m so impressed. Homemade cards are brilliant and these look very smart. Well done on your award. Thank you, I’ve used the diagonal before and I think it uses the papers well without being too much. Sorry for commenting so late but I have been away. And WOW, well done on being included in the list, that is fantastic! You must have been so happy, but I am not surprised. Your cards are super. I love this trio too. The diagonal cut is very effective and yes, a cute bear is good for everyone. I hope you celebrated! Thank you, hope you had a lovely time. I haven’t celebrated, I’m not really sure what is a suitable way to celebrate that! 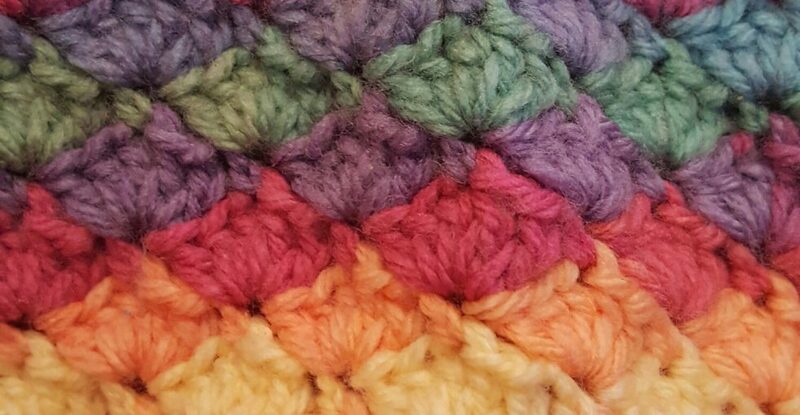 Maybe a cardmaking related treat? But don’t tell Mr C, he’s already sweating about me needing a craft cupboard extension! They’re lovely! I love Forever Friends, but a lot of my friends and family don’t. It’s a shame you can’t just make cards for yourself! Lovely! There is something really satisfying about kits, and this is such a lovely kit! Thank you, it is lovely. Kits are prefect for when I’m in a rush! The black and gold would also make it perfect for new years cards (i dont know if thats a thing – but maybe we can make it a thing!) Or graduation or wedding anniversary! Wow! It’s awesome, there’s a huge range of sentiments for all occasions. My belated congratulations! All cards are wonderful, the first one is my favorite. 🙂 These bears are really cute!